The classic tales you know, the characters with secrets you don't. Ayo is a lonely boy, bullied and withdrawn, until one day his father sends him away to the kingdom of Azizi, to study under the king’s advisor, Issa, a fearsome tiger, that thinks and talks like a man. Ayo misses his father and one day he takes it out on his new companion. The next morning he wakes up to find he is starting to turn into a beast himself and if he’s to ever turn back into his human form, he has a lot to learn. Queerky Tales is a series of classic fairy tales retold with LGBT characters. 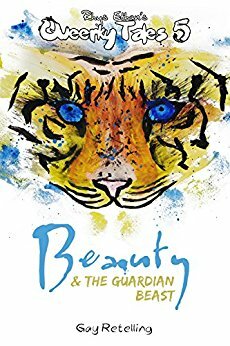 Based on the French classic, Beauty & the Guardian Beast is a tale about oppression, kindness and forgiveness. Writer of the LGBT retellings "Queerky Tales". Author of fantasy and sci-fi. Also writes queer adult romances under the pen name "Chris Ethan". Struggling actor and a juggler of graphic design, book covers, photography, filmmaking and too many hobbies to be considered a sane person. Rhys welcomes you into his digital home where you can find out everything he's up to and explore the life of a professional crazy person.